Dinosaur Comics - July 9th, 2009 - awesome fun times! 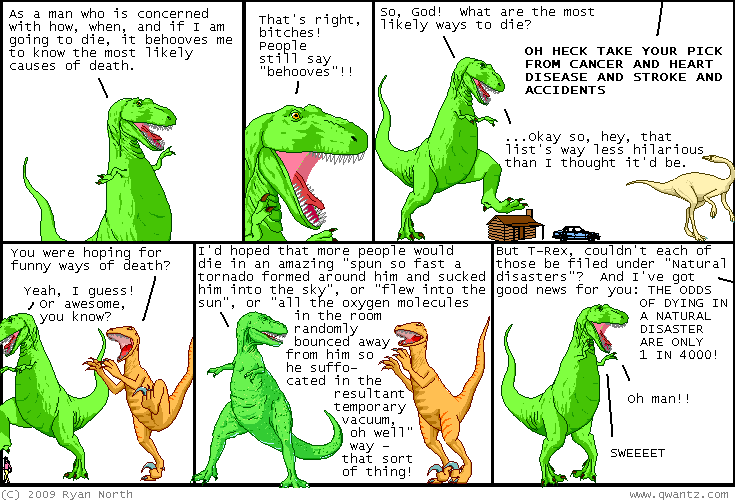 July 9th, 2009: Shortly after this comic went up, Greg sent me a link to The Odds Of Dying From..., which is very handy if you're an American and you want to know the lifetime odds of dying from, say, a "foreign body entering through skin or natural orifice", which are (just?) 1 in 103,004. FLASH UPDATE: A few readers pointed me to the WHO International Classification of Diseases, 10th Edition, which enumerates all sorts of problems you can have, more completely than the selection I linked to above. And it's only a hop skip and a jump from there to just reading this list as Tons Of Ways You Can Die. There's no probabilities, but it includes some fun ones like T63.9 ("Toxic effect of contact with unspecified venomous animal"), W.19 ("Unspecified fall") and V97.3 ("Person on ground injured in air transport accident"), clarified on the site as "Sucked into a jet". One year ago today: "by doing some simple pronoun and name substitutions, you can read all about loheta's adventures. in some of them, he's got breasts!"